Custom Log Desk the Starr desk. Contemporary Modern Walnut Desks. Reclaimed wood furniture handmade to order. These log desks are sawn from exceptionally large logs. The trees measure up to 6′ in diameter. They are generally cut on an Alaskan chain saw mill. These log desks are truely one of a kind pieces of functional art. Your clients will take notice of you and this desk. Call today to order a custom log desk for your home or office. Art Display Cabinet with Video and Audio. This cabinet’s glass shelves are held in place on stainless steel wire. Unique dining table using book matched walnut slab top with matching slab trestle base. Our tables are unique, unusual, one of a kind and artistic. Call today to get a quote on your piece of custom reclaimed wood furniture! Rustic Log Table Nakashima style double cherry with inlaid ebony butterflies and natural edge slabs. Curly Pennsylvania cherry slab rustic log table with natural free form edges. Ebony butterfly accents, maple base with cherry feet and hand rubbed oil finish. Our beautiful reclaimed wood furniture is handmade from unusual woods. This queen size platform bed is constructed of solid Pennsylvania Cherry with 6 drawers in the base of the bed. The headboard is made from a natural edge Siberian Elm slab with Ebony butterfly accents. Call for a free quote on any of these reclaimed wood furniture pieces. Unique bookcase -Sycamore made from 3 matching pieces of log that were about 3′ in diameter. Natural edge Quarter Sawn Sycamore Bookcase with 3 matching shelves and cherry uprights. Handmade bar stools, chairs, benches along with tables, kitchen tables, and formal dining tables. Cherry bar stool with a delicate frame which helps make for a sturdy yet light weight frame. Custom furniture gallery art-Custom Bookmatched Nakashima Style Maple Burl Coffee Table with Ebony Butterflies.Size 32″ L x 18″ H x 25″ D.
Oak and Ash Armoire or Wardrobe. We build a variety of sizes. Call about a custom unit today! An Oak and Ash armoire/wardrobe with interior clothing bar and full chest of drawers. Size 54″ W x 79″ H x 25″ D.
Nakashima Style Claro Walnut 4′ Slab Dining Table With Pedestal Base. 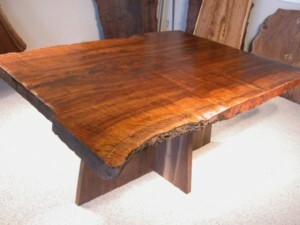 If you’re looking for a spectacular, one of a kind dining table, conference table or office table give us a call today! We have a wide selection of beautiful custom reclaimed wood furniture to choose from. Hand rubbed hard oil finish brings out the beauty in this amazing top.Size 47″ W x 30″ H x65″ L.
Spectacular Claro Burl Walnut Slab Dining Table! Claro Walnut Burl Slab Dining Table With Pedestal Base. We build spectacular custom reclaimed wood dining tables using large slabs of walnut, cherry, and maple… the finest available. Call us today to order yours. Tapered Claro Walnut Slab Dining Table With Pedestal Base. Handmade, handcrafted, unique, one custom reclaimed wood furniture made to order. Tapered Claro walnut slab dining table with walnut pedestal base. Nakashima Style Hour Glass Shaped Claro Walnut Slab Dining Table. Handmade, Unique, custom built reclaimed wood furniture made to order. We also do traditional dining and kitchen tables. Hourglass shaped Claro walnut slab dining table with walnut pedestal base. Unique Maple Sideboard with Walnut Slab Top. The 2″ thick highly, figured Claro walnut slab is suspended on 3″ above the solid curly maple cabinet by 3/4″ rebar. The beautiful dovetail corners of the cabinet show off the skill of the artist. Bookmatched Spalted Curly Maple Coffee Table with Tulipwood Butterflies done in the Nakashima furniture style. This custom rustic coffee table is natural edged, spalted curly maple slabs, highly figured and book matched to make this very unique and beautiful coffee table. A natural edge cherry slab acts as a shelf under the top to place frequently referred books, magazines, or remotes. Nakashima furniture style gallery art – English Walnut hour glass shaped dining table or conference table with Ebony Butterflies.This table will seat 8 people. Crotch Walnut Slab kitchen island with a maple base. Custom islands built in walnut, cherry, and maple.